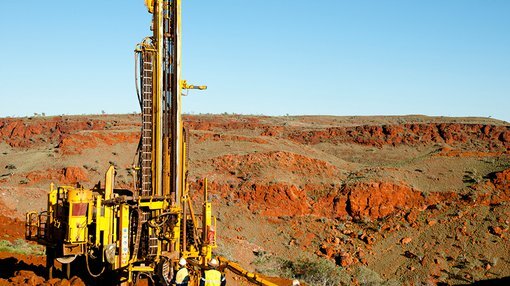 Copper-gold exploration company, Kalamazoo Resources Limited (ASX:KZR), has today revealed that it has entered into an option to acquire between 80 per cent and 100 per cent equity in three highly prospective Pilbara gold projects. Covering some 252 square kilometres, these include the DOM’s Hill Gold, Sisters and Marble Bar Gold Projects, controlled by WA resources industry veteran, Denis O’Meara Prospecting (DOM) and Brett Keillor (KS Gold Pty Ltd). The tenements show potential to host significant gold mineralisation, and are situated in close proximity to the Pilbara gold projects of Novo Resources (TSX.V:NVO) / Artemis (ASX:ARV), De Grey Mining (ASX:DEG), Venturex Resources (ASX:VXR), Impact Minerals (ASX:IPT), DGO Gold (ASX:DGO,) and Calidus (ASX:CAI). 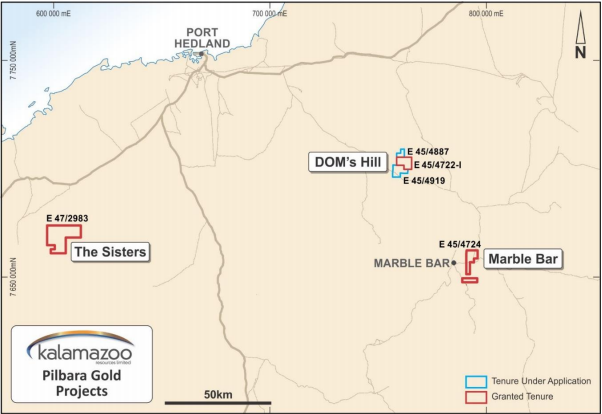 The DOM’s Hill Gold Project is located 110 kilometres south-east of Port Hedland, and resides in a prospective gold area that is the subject of active exploration. The project comprises one granted exploration licence and two exploration licence applications, covering 68 square kilometres. These tenements contain extensive gold in soil anomalies and numerous historical significant gold drill intercepts. Recent prospecting has recovered an estimated 300 ounces of gold nuggets from poorly explored areas. In light of the recent discovery of a considerable number of gold nuggets within the project area, the exploration success of Artemis and Novo in the West Pilbara in a similar geological environment, and the resurgence of gold as an essential commodity in the Pilbara, robust systematic exploration is warranted here, initially targeting gold. Nearby, the Sisters Gold Project is a granted tenement of 139 square kilometres, located 100 kilometres south-west of Port Hedland. The project is centrally situated within one of the most actively explored areas of the Pilbara. Here, recent exploration has discovered significant shear hosted and conglomerate hosted gold mineralisation. Strategically, the Sisters Gold Project is adjacent to De Grey’s Pilbara Gold Project and is situated within 30 kilometres of De Grey’s proposed new purpose built processing plant. Finally, the Marble Bar Gold Project is a granted 48 square kilometre tenement, 6.5 kilometres east of Marble Bar and 11 kilometres north of the intriguing Klondyke gold project. It comprises a 12 kilometre strike of the prospective Archaean Warrawoona Formation. This project also has potential for containing basal sedimentary units of the Fortescue Formation. KZR plans to immediately commence exploration activities to determine prospectivity in relation to identification of quality gold prospects based on historic nugget recovery, potential for conglomerate-hosted gold below Mt Roe Basalts (which has been prolific in the region), as well as potential for other gold occurrences in quartz veins, shears and epithermal zones. KZR has acquired a 90-day option across each of the projects for the payment of $125,000 (made from existing cash reserves) and the issue of shares in KZR to the value of $200,000.